If you’re a larger guy, you may think it’s a lot harder to look stylish in a suit. Well, that definitely doesn’t have to be the case. No matter if you’re taller than average, are particularly broad or muscular, or a little rounder in the middle, there’s lots our tailors can do to make you look your absolute best. It’s all about scale and balance to make sure your jacket looks the best it can be. So if you’re broad across the chest and middle, we’d create a jacket with wider lapels and a larger chest pocket to get the scale right. We also might suggest slanted pockets to make your torso look slimmer, as it leads the eye in and up your frame. As for fit, less cloth is definitely more. You want a suit jacket that creates a trim, flattering silhouette and minimises the amount of fabric used to create it. A look you’ll always get if you ask HKT to create a tailored suit for you. If you’ve got a bit of a tummy, the big question is: do you wear your trousers under your tummy? Or do you wear your trousers over your tummy? The answer is: choose one or the other, and never go half way. At HKT, we think high-rise pants are the more elegant choice, mainly because you can wear a great fitting vest which hides the waistband of your pants, creating a really neat silhouette. We also suggest rounder guys never wear a belt with over-the-stomach trousers and instead opt for suspenders. This also allows you to wear your pants slightly looser. With regards to the style of your trousers, flat-fronted looks great if you’re wearing your pants high on the waist. This also allows you to have a more tapered trouser; however, it’s important not to taper too much, as this can unbalance the look completely. If you go for single or double pleats in your pants, which have become increasingly popular lately, then a slightly wider trouser leg is a good option because it looks more natural. But, you still want to avoid excess material that doesn’t drape well on your figure. If you’re a bigger guy with shorter limbs, a well-proportioned hem will elongate your legs rather than cut them off in an awkward spot. Again, a tailor is your friend here. The top tip here is to avoid very lightweight fabrics. Instead, we recommend you choose a medium to heavy weight fabric that will hang well over shoulders and give a bit of extra structure to your pants. You certainly don’t want something that’s floating around and sticking to your body. Good choices for guys who are rounder in the middle are mohair cloths and English and Scottish tweeds. As for patterns, the world is your oyster – and especially at HKT. Just because you’re on the larger size, doesn’t mean you can’t go for checks, herringbone, or anything else that grabs your fancy. For men who are six feet and above, it’s all about scale and balance again. For example, we wouldn’t recommend a jacket with a single button, as this leaves a lot of jacket material with no buttons. Instead, we’d always suggest that a taller guy has two buttons on their made to measure jacket, because this breaks up the expanse of material. Another good trick for a tall person is to have the point where the lapels meet the top button at a lower height than normal (single-breasted jacket only). This will create a better balance for someone with a longer torso. We also suggest pocket handkerchiefs, ticket pockets, and quite a bit of exposed shirt cuff for a taller man too. At every opportunity, the aim is to interrupt your look and any large spaces of cloth. That’s also why we usually favor a double breasted waistcoat for a taller man than a single breasted one, although you have to be careful it isn’t cut too high, as this can unbalance everything. For very tall guys, it’s best to go for a more tapered trouser, because the overall look is much neater. If you went for a wider trouser leg, you can end up looking like a 1950s mobster, and nobody wants that. Again, it’s all about minimizing the amount of cloth used for the whole suit. Another couple of top tips for tall guys is to wear a belt that’s nice and visible, as it breaks up your look. And it’s definitely worth considering having trouser cuffs (turn ups) for the same reason. Our advice for tall men is exactly the same we give to men with rounder middles: go for a medium to heavy cloth that offers comfort and structure. That’s because you definitely don’t want something that’s light and flighty and flaps around your frame. The good thing is that at HKT you have hundreds of world-class materials to choose from that will offer you everything you want in terms of weight and pattern. These include exquisite fabrics from the likes of Scabal, Dormeuil, and Holland and Sherry. Most men do not have a significant change in size from their chests to their waist. But with guys who are broad across their chest and shoulders, or are particularly muscular, such as a pro athlete or bodybuilder, an extreme triangular silhouette can be created. Finding an off-the-peg suit jacket or blazer to flatter this shape is really difficult, because what usually happens is that a man finds a jacket that fits their shoulders but everything below is rather billowy due to excess material. What a broad or muscular guy needs is something that fits their shoulders perfectly and then tapers slightly at the waist of the jacket before widening again near the hip in imitation of the body’s shape. Something that’s only possible with a bespoke jacket. Broad and muscular men often have large biceps and forearms too that can again create issues. Finding a sleeve that accommodates these features can be tricky, which is why a tailored suit jacket is the best way to go. At HKT, we also make sure detailing such as pockets and lapels are balanced on a broader man’s jacket to make everything look proportional. As mentioned in our jacket guide for guys with rounder middles, this often means creating wider lapels and chest pockets. Another excellent choice for broader and muscular men is a vest, as this covers the lower half of the torso but not the upper, helping to create a more balanced look. Usually, we recommend a single-breasted waistcoat for this type of client because we can easily put extra darts in the back to make it fit perfectly over the chest. It certainly isn’t uncommon for men who are broad at the top or muscular to have problems in finding great fitting pants. The issue being that their thighs and buttocks tend to be a lot bulkier than their legs below the knee. Typically, this means this type of customer has to go with a trouser with a large waist to accommodate their thighs and buttocks, which then leaves them with pants that don’t fit them well and lots of excess material below the knee. But come to HKT and what we would create for you are suit pants that fit you superbly around your waist, then ease out to accommodate the upper part of your leg and then begin to taper back in so your pants fit great around your slimmer lower leg. We also suggest that men with muscular legs wear their pants high, as it means the eye isn’t drawn to their narrow stomach (the tip of their triangular shape), which would happen if only a shirt was covering this area. Another good suggestion for guys with well-developed legs is go for double pleats on their pants. This is because they offer extra room and flexibility in the seat and front of the trouser without widening the pants too much. As with rounder and taller men, we’d always suggest a heavier fabric such as high-quality wool for a broader or muscular guy. This is because this type of cloth will drape smoothly over their shoulders and chest, and stay more in place when they move. Going for a premium wool fabric will also lead to a better result below the waist. You will get flatter planes instead of the rounded shapes that lighter fabrics can create. Although it’s important to note that the bottom of your pants should just kiss against your shoes, because any gathering of material will start to create ballooning and unbalance your silhouette. So, there you have it, our guide to suits for larger men. 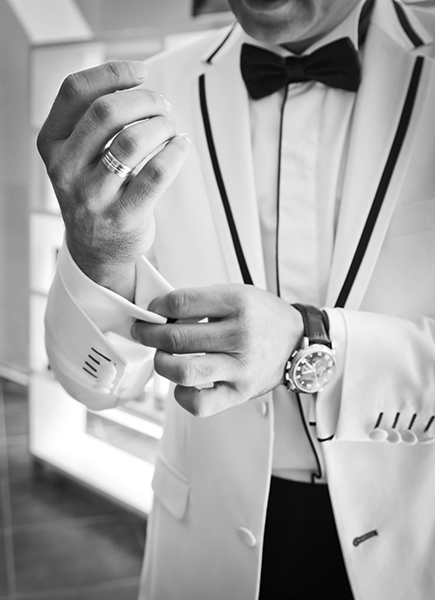 We hope you enjoyed reading it and feel inspired that whatever your size, you can look super stylish when you’re in the hands of tailoring experts. But please don’t take our word for it and do nothing about it. Book a free consultation with one of our style consultants. All you need to do is call us on 770-458-8682, email service@hktclothiers.com, or use our online booking form to arrange an appointment.